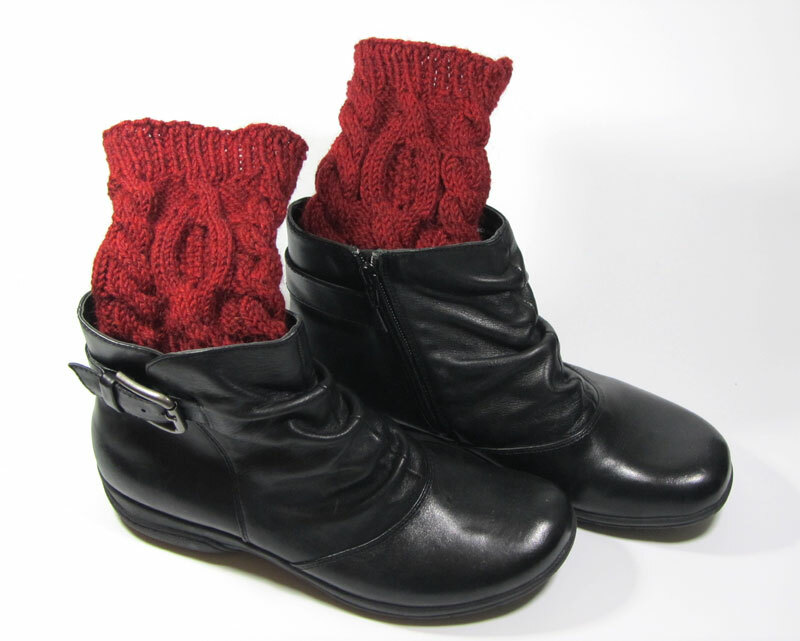 Boot cuffs are the new accessory I didn’t even know I needed. Or wanted. 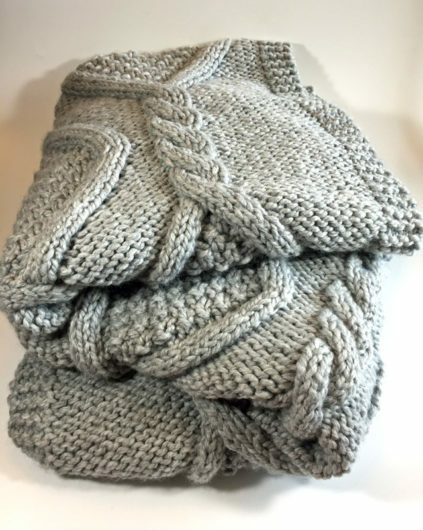 They knit up quickly and make great gifts. 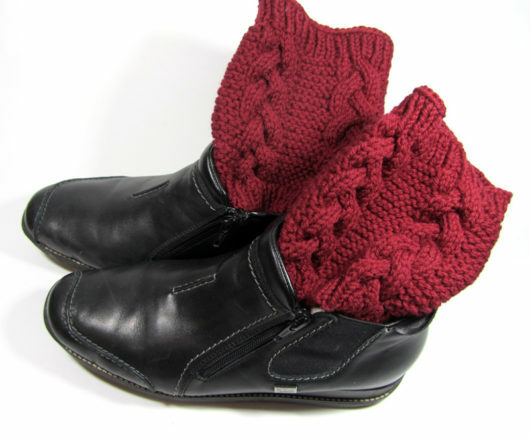 Plus, they really can make boots look cool–like you’re wearing heavy fancy socks. 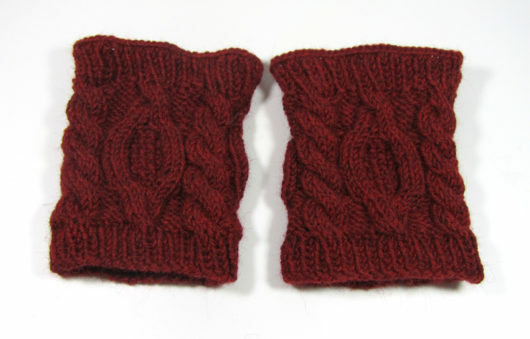 These are knit in Brown Sheep’s Lamb’s Pride Superwash worsted. I’d never tried the superwash version of this yarn before. I was impressed. 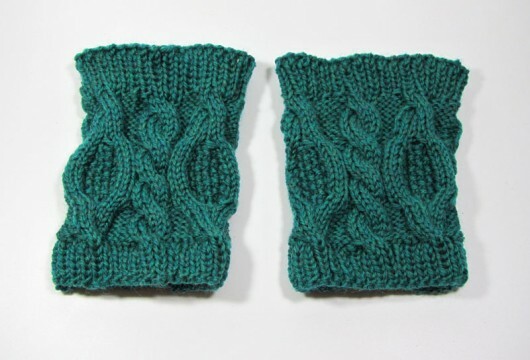 The colorway is a newer one–holly green. This is a Kate Bostwick (Cowtown Knits) pattern: Jennifer’s Boot Cuffs. The pattern is clearly written, with no mistakes. I’ll be making these again. Well, that was quick. 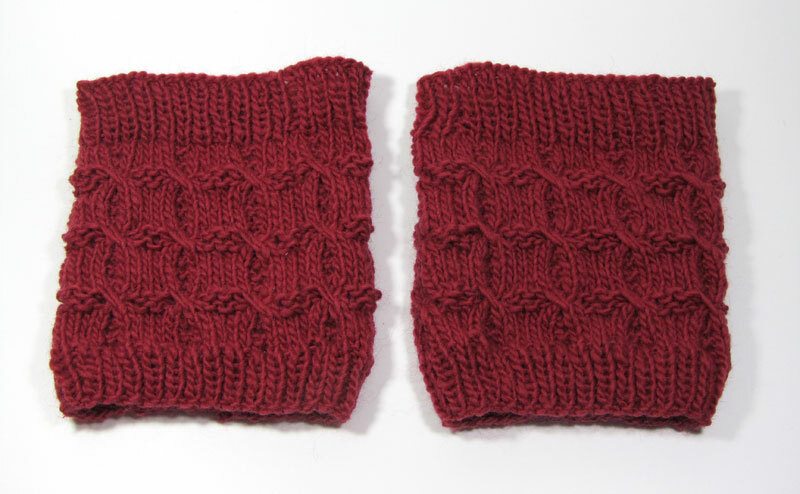 This pair of Jennifer’s Boot Cuffs is knit of Berroco Ultra Alpaca worsted. That’s the yarn that Bostwick recommends. They came out great. 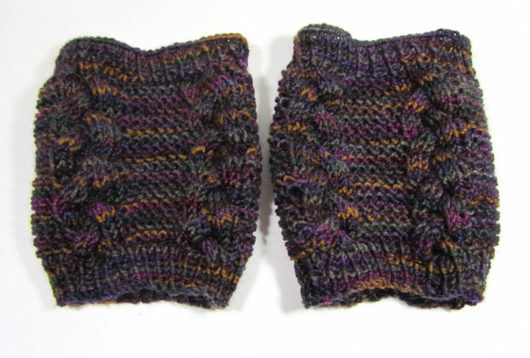 And there are a million color choices in this Berroco yarn. 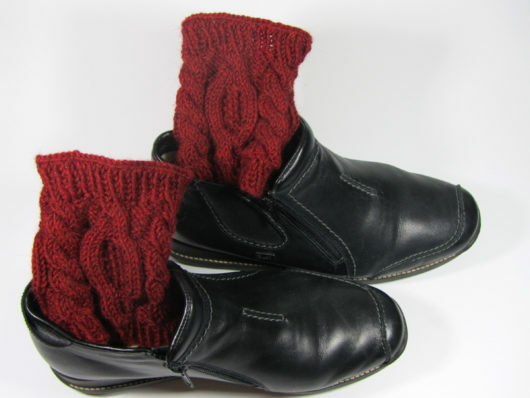 As with all the boot cuffs, you can wear them on your legs, sticking them out of your boots. 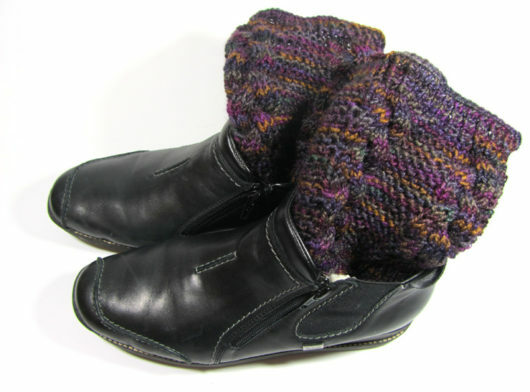 Or can put them on your leg inside-out and then fold them down over the top of your boots. Quite cozy. Some boot cuffs are a bit super-sized. 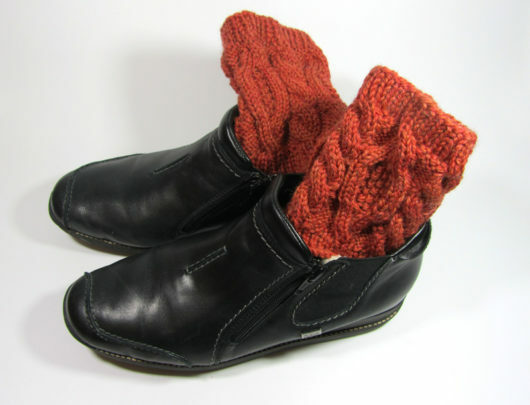 They are best worn tucked into the boot and rolled back and in the larger version might just be worn over the boots to create a nice warm seal against the cold. These little gizmos do actually make boots warmer. 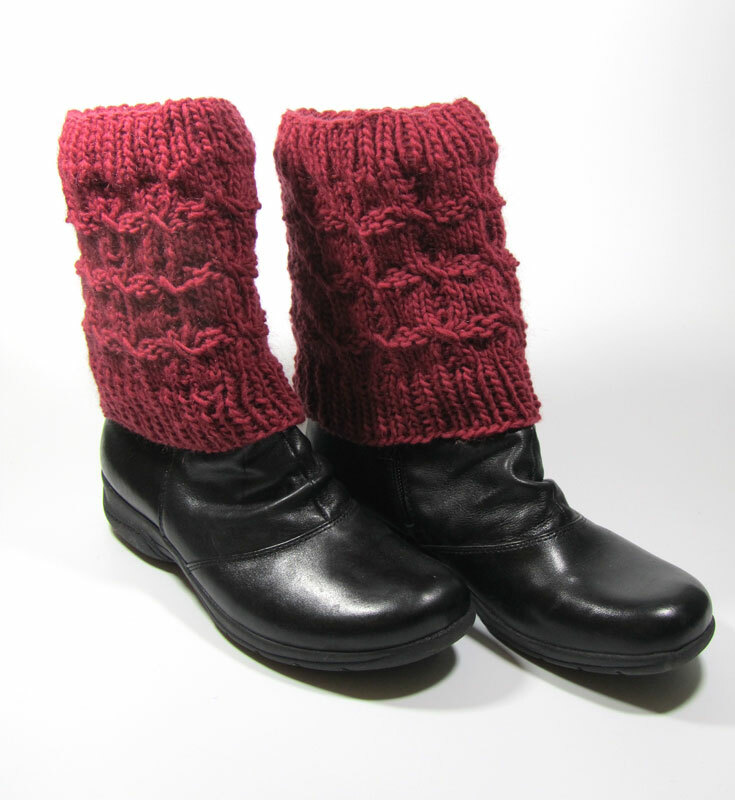 This is Simone Kereit’s (Owl Cat Designs) Hemlock Shade Boot Topper, knit in Orchid with Cashmere by Harrisville Designs. 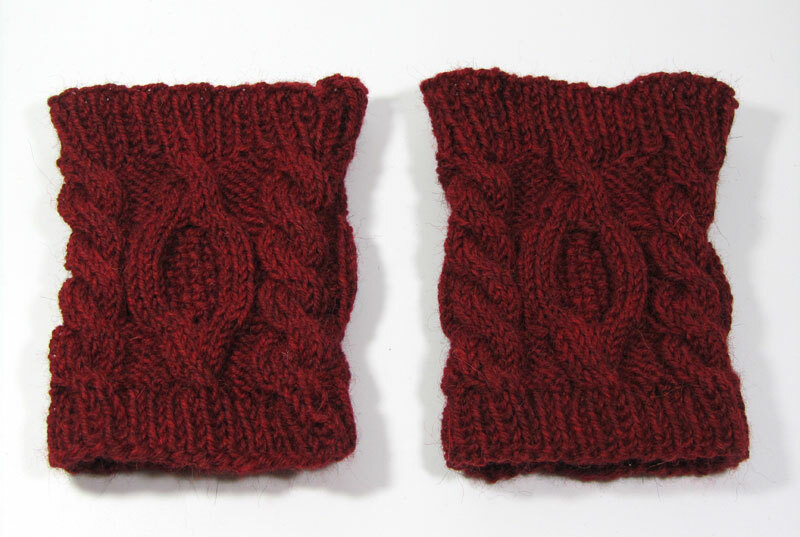 It’s an Aran weight 10 ply, in 70% wool, 25% mohair, 5% cashmere. It isn’t part of the Harrisville line-up any longer. 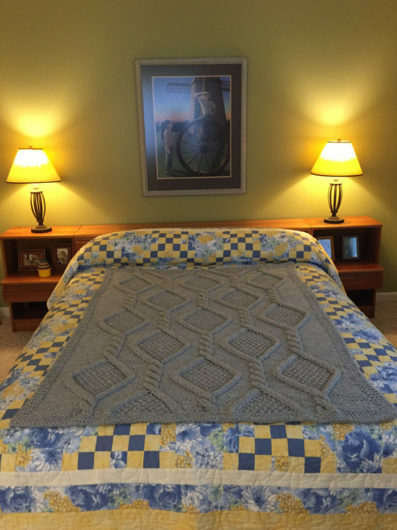 During the recent Ravelry Gift-Along staged by the Indie designers on the site, I won a choice of one of Kereit’s patterns and this was my pick. It’s an unusual cable and quite fun to work. 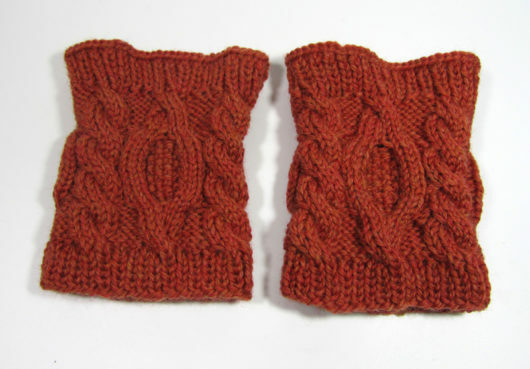 The narrow looping vertical cables are connected by horizontal bits of garter stitch. What little I know about hemlock has to do with Socrates and corrupting the youth of Athens. But these boot toppers are still quite nice and are probably inspired by the coniferous plant, hemlock, not death by poisoning. Finally, here’s a freebie in the midst of paid patterns: Codi Hudnell’s (Knit Grit) Hurricane Boot Cuffs. 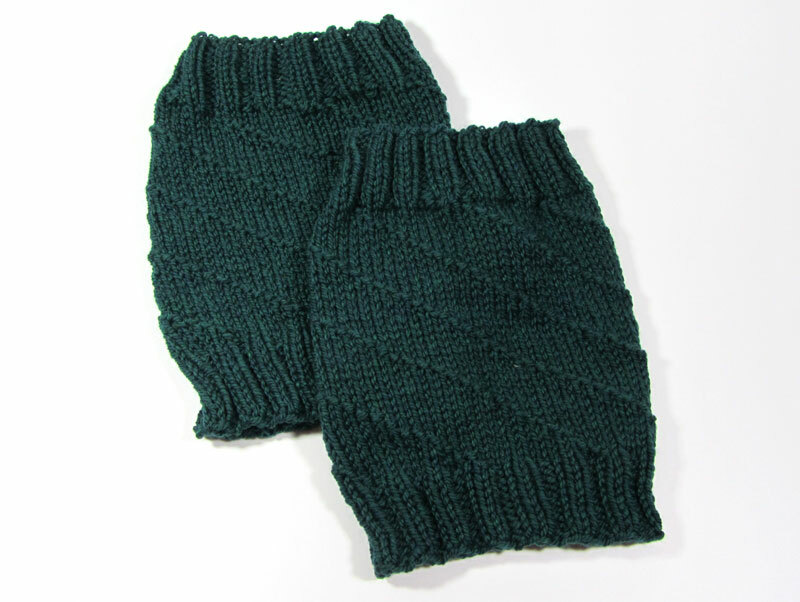 Mine are knit in Stonehedge Fiber‘s Shepherd’s Wool worsted. 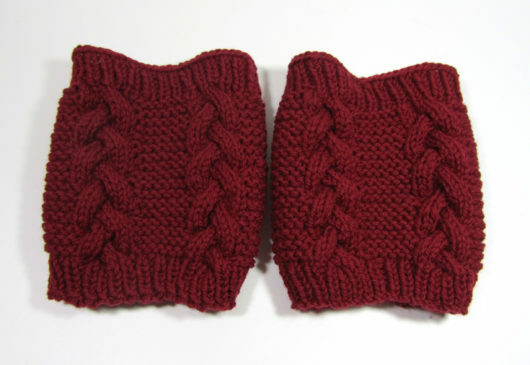 There’s a teeny hiccup in the pattern. 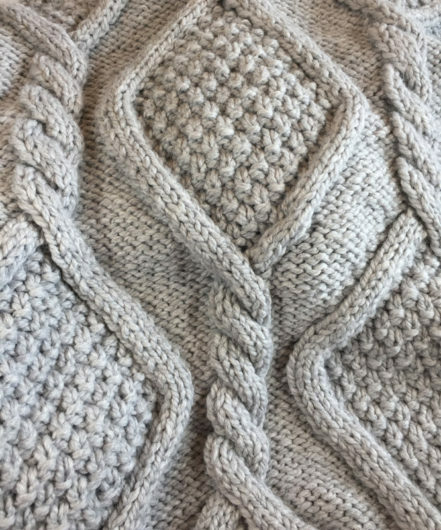 If you just keep knitting 9 and purling 1 thoughout the rounds, as the pattern directs, you’ll not end up with the spiral hurricane look. 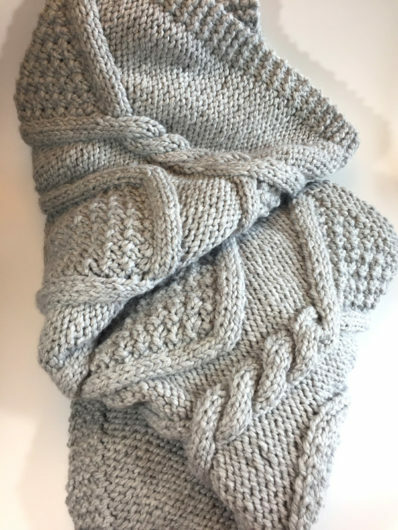 At the start of each round, just be sure that your first purl is one stitch further along the line of purl bumps, and then the knit 9 works throughout the rest of the round. I had to polish my boots for these photos, but it was worth it to show them off!